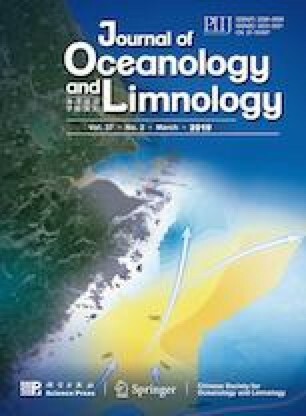 Phytoplankton diversity and abundance were determined in ballast water from 26 vessels in the Shanghai Yangshan Deep-Water Port from April 2015 to January 2016. In total, 84 species of phytoplankton were identified, belonging to 43 genera and 5 phyla. Bacillariophyta (75.0%, including 30 genera and 63 species) were the dominant algae in the ballast water. Their density ranged from (5.55±9.62) SD to (1.878±0.872)×10 3 cells/L, with a mean of 410.1 cells/L. Nine potentially harmful phytoplankton taxa were detected: Ceratium furca, Ce. marcroceros, Leptocylindrus danicus, Coscinodiscus radiatus, Co. granii, Prorocentrum micans, Melosira sulcata, Meuniera membranacea and Skeletonema costatum. Our survey and identification results showed that Microcystis aeruginosa, Ankistrodesmus falcatus and Scenedesmus survived in the high-salinity ballast water, even though they are freshwater species. We identified the common features of surviving phytoplankton and impacts on the phytoplankton assemblage of ballast water age and source. Our goal was to understand the adaptative mechanisms of phytoplankton in ballast water, providing statistical and theoretical support for future ballast water research and suggesting a scientific basis of ballast water management and inspection of vessels entering the port. Supplementary material is available for this article at https://doi.org/10.1007/s00343-019-7288-9 and is accessible for authorized users. We are very grateful to the Shanghai Entry-Exit Inspection and Quarantine Bureau, as well as to the officers and crew of all the vessels that were boarded and sampled. The comments and suggestions of the reviewers are greatly appreciated. Supplementary material, approximately 90 KB.